Upgrading your flat TV's sound makes a huge difference – here are five options. Upgrading your flat TV's sound makes a huge difference. The latest televisions are so slim that it's just impossible to fit decent speakers in them. The result is that, while picture quality has improved dramatically in recent years, the latest TVs actually sound worse than the big, boxy ones that came before them. The good news is that it's easy to fix this with an affordable upgrade. You'll get a bigger, better sound and dialogue becomes much clearer. You can even get cinema-style surround sound in the comfort of your living room. These long, slim speaker bars are designed to sit below your TV, whether it’s wall-mounted or sat on a cabinet. They give you proper stereo sound without adding clutter. If you want extra bass you can add a subwoofer. This is a separate bass speaker that can be stowed anywhere in the room – some are even designed to fit under the sofa. Soundbars often also have built-in Bluetooth so you can play music from your phone or tablet wirelessly through its speakers when you're not watching TV. This works much like a soundbar but it's a different shape. It's a box more like the size of a DVD player. Your television sits on top of it. That extra depth means more room for speakers, which aids the performance especially when it comes to low bass sounds. Some high-end soundbars are called sound projectors because they contain lots of small, focussed speakers. These bounce beams of sound off the walls and ceilings very precisely to create surround sound effects. Thanks to this clever technology, sound can appear to be coming from behind you, even though the speaker is in front of you. True surround sound gives you cinema-style ‘it's behind you’ moments by placing speakers exactly there - behind you. The norm is called a 5.1 system. At the front you have a pair of speakers, one on the left and one on the right. Then there's a front speaker in the centre that's used especially for dialogue. Behind you there's another pair of speakers, one on each side. That’s the five; the ‘point one’ is a subwoofer speaker to add bass oomph. This sounds like a lot of clutter but many of the latest speaker systems connect wirelessly so you won't need cables trailing all over the floor. You will still need to plug the speakers into the mains though. More speakers and more subwoofers can be teamed to give you an even bigger sound and more precise surround sound effects. The latest innovation is 3D sound such as Dolby Atmos which adds speakers beside you, either mounted in the ceiling or floor-standing speakers that bounce sound off the ceiling. Sound effects come from all around you, even from above and below. Do I need a TV licence for streaming services? 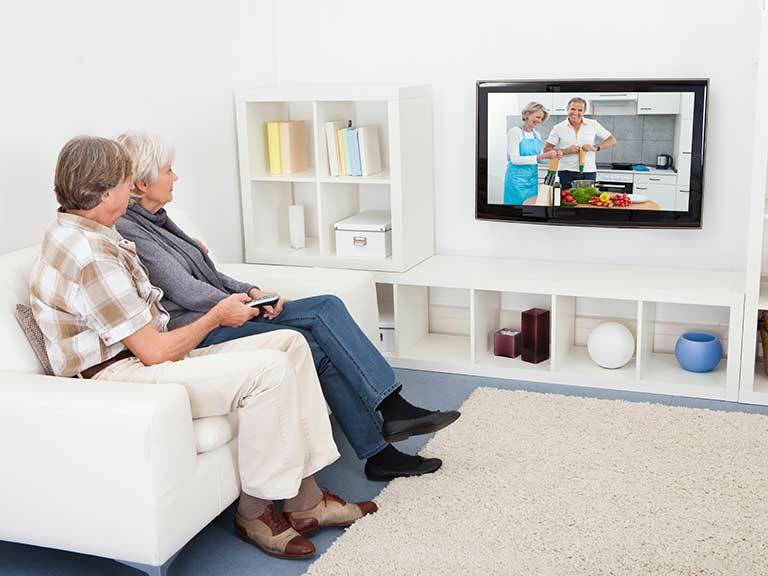 Digital TV: Freeview, satellite or cable?